Thallus: foliose, mostly < 3 cm diam., forming adnate rosettes with short lobes, especially when on rock, or with elongated and more erect lobes when growing on thin branches lobes: radiating or irregularly arranged, slightly scattered or overlapping, dorsiventral, adnate to ascending, (0.5-) 1-2 (-3) mm wide, ascending, rounded, flat or slightly canaliculate with short branches; margins: crisped (undulate and ± ascending), crenate to crenate-incised, ultimate segments mostly short and 0.2-1.0 (-1.5) mm wide upper surface: yellowish green or mainly greenish yellow, or almost grayish green in more shaded habitats (gradually turning yellowish brown in the herbarium), smooth, dull, without maculae soredia: bright greenish yellow, finely granular, in marginal, roundish to crescent-shaped soralia (or occasionally partly laminal) upper cortex: paraplectenchymatous, 22-30 µm thick, the cells heavily pigmented with yellow granular inclusions; uppermost cells isodiametric, 2-3 µm diam., cells of lower layers elongated, 3-6 x 2-3 µm; epicortex: hyaline, 1 (-2) µm thick medulla: yellow; very loose, much incrusted with yellow pigment granules, hyphae 3-6 µm thick photobiont: cells 5-15 µm diam., layer 20-45 µm thick lower cortex: paraplectenchymatous, clearer than the upper cortex, with few granular inclusions, 25-50 µm thick lower surface: concolorous with upper surface or pale yellow to brownish yellow with scattered whitish rhizines Apothecia: very rare, submarginal towards tips of lobes, c. 1-2.5 mm broad; disc: rather pale red-brown, flat, epruinose; thalline margin: confluent with upper side of thallus, even, sorediate; hymenium: 70 µm tall asci: broadly clavate, 25-35 x 10-12 µm; tholus: with strong amyloid reaction; 8-spored ascospores: almost spherical, c. 5-6 µm diam. Pycnidia: rare, on projections, pyriform to almost spherical, 80-120 x 70-100 µm, wall 20-30 µm with c. 3 layers of isodiametric cells 2-3 µm, black in upper parts, dark brown in lower conidia: sublageniform, 6-8 x 2 µm Spot tests: cortex K-, C-, KC- or + yellow, P-; medulla K-, C-, KC-, P- Secondary metabolites: cortex with usnic acid; medulla with pinastric and vulpinic acids (majors), zeorin and unknown aromatic substances (accessory). Substrate and ecology: on bark or wood, most frequent in open, continental mountain forests, generally at medium to high elevations, often in cold sites and tolerant of snow burial World distribution: circumboreal, low arctic and lower alpine regions to the south; North America, Europe and Asia Sonoran distribution: Arizona, 2500-3660 m, in mixed conifer forests and into the alpine. 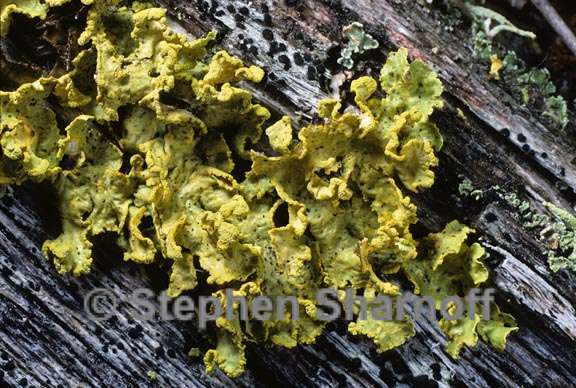 Notes: Usually it is easily recognized by the characteristic bright yellow color of the primarily marginal soralia, which contrast with the duller, more grayish or greenish yellow of the rest of the upper surface. The width, arrangement, and especially the adnation, of the lobes are somewhat variable; morphs with very narrow, crowded and appressed lobes can occasionally (especially if heavily sorediate) be confused with coarse forms of Candelaria concolor, but in that species (which is more common at lower elevations and in rather dry sites), the upper surface has virtually the same bright yellow color as the soredia.